The group of characters now known as the Disney Princesses as a brand are a money-making machine for Disney. For internet artists and comedians, their iconic clothing and colors that make them so recognizable to little children also make them a tempting trope for blending with just about anything—the more ridiculous, the better. Here are a few examples of making some random group of things into recognizable Disney Princesses. Finnish DeviantART member Hapuriainen reimagined Disney Princesses as Pokemon trainers and drew them in anime style. That proved to be so popular that she did more, and more, until there was an entire series of Disney characters in this style. Then she gave some of them additional clothing and accessories! See Ariel, Snow White, and Belle. DeviantART member TortallMagic, Cherie Potter, uses the character Olaf from the movie Frozen as a starting point for many different mashups. She dresses him as everyone from Santa Claus to Game of Thrones characters. The list includes the Disney princesses, of which there are now 17 illustrations. A couple of years ago, the internet went wild for sloths. Phillip Light used the animal’s distinctive features, namely the face, claws, and their tendency to lie flat and move slowly, in his version of 11 Disney Princesses. Buzzfeed illustrator Jen Lewis drew Disney Princesses as Minions, comical characters first seen in the movie Despicable Me, which is not a Disney film. She immediately apologized for them. More recently, Lewis considered the recent mania for anything related to Donald Trump as a sign that he’d make a good Disney Princess. See all nine of them. Laura Cooper is the artist behind the webcomic XP. She also does commissioned art. 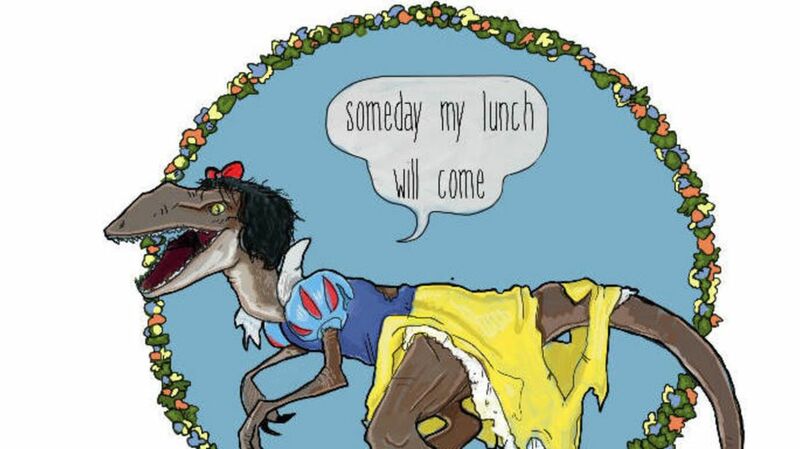 One of her side projects is Velociprincesses—Disney Princesses reimagined as Velociraptors. On the surface, that could be just another of many Disney Princess mashup ideas, but her quotes that go with each dino-princess are priceless. There are a dozen in all. Anna Hezel and Gabriella Paiella of Lucky Peach dressed up hot dogs as Disney Princesses for a joke post, a sort of commentary on the silliness of the trend of mashing up Disney princesses with anything. And a lot of folks thought it was funny. But then Disney Princess fans started recreating them at home, and they became a hit all over again for a different reason! They’re both cute and silly, and a fun project to share with the kids. Kevin Bolk looked for the most uninteresting thing possible to make a statement about the mashups. He ended up “reimagining” Disney Princesses as piles of rocks! It struck a chord: he got 44,000 comments on the post, and those were just Tumblr members. Gemma Correll has several more ideas for Disney Princess mashups in case someone wants to do a whole series. My favorite is the Prokaryotic Microorganisms. See also: 20 Artistic Takes on Disney Princesses and 10 Downright Dangerous Disney Princesses.